One of the most popular islands to visit, Mykonos is full of energy and places to dance the night away. It also has beautiful towns, great food, and the experience of the beach clubs is unparalleled. For a DJ fueled day at the beach, head to Principote. The beach is beautiful, beach chairs and lounge space are great, and although your wallet will be hurting, it is a fun thing to experience. Scorpios has quickly become a popular spot and for good reason. The space is carved into a cliff side above the beach and features incredible restaurants, bars, a hotel, beach club, and plenty of space to enjoy the views. Dinner at sundown followed by drinks and dancing is a great way to experience it. 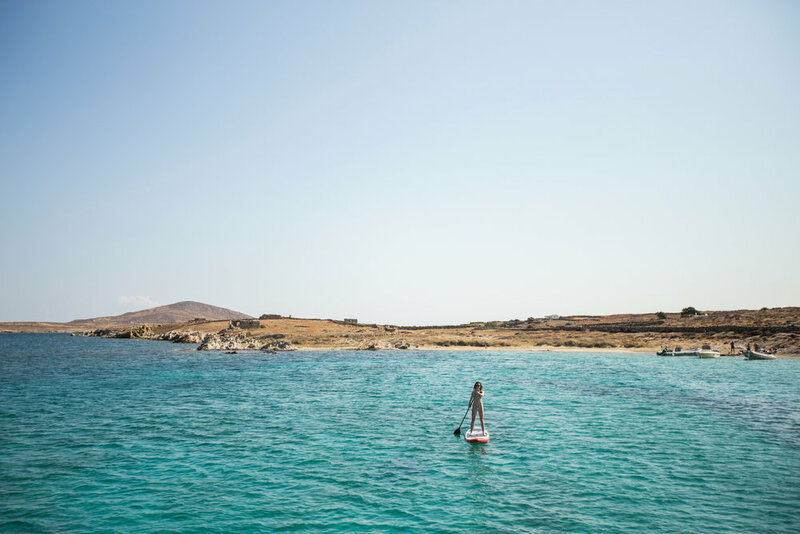 When you are tired of DJs and dancing, a day spent on a chartered catamaran is a wonderful way to rest and experience the areas around Mykonos. We did a semi-private charter with a small group of people and it was a highlight of our trip. The day was spent at different turquoise water coves where we swam, snorkeled, SUPed, and relaxed with fresh food & drinks prepared by our captains. Just above Mykonos Town is My Mykonos Hotel. More reasonably priced than other surrounding hotels, the service is still outstanding and the grounds are beautifully designed. It is a short walk in to town, although the hill is steep and a little precarious in the dark. 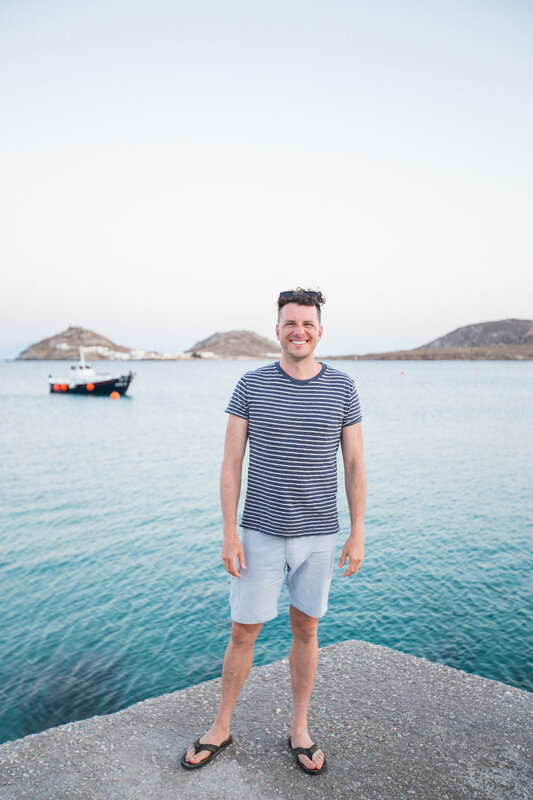 At night, Mykonos Town is buzzing into the late hours—it really comes alive once the sun sets, which is pretty late in the summer. The narrow walking streets wind you through the town and past all kinds of gorgeous restaurants, bars, clubs, and shops. A travel connection through Athens is very likely, and something to be enjoyed for a few days. Central Athens is very lush and has lots of restaurants and cafes lining cute streets. The Acropolis is equally as fascinating as it is touristy. The structures are awe inspiring and the views of the city can’t be beat. Enjoy a drink on a rooftop bar with a view of the Acropolis at sundown for a favorite Athens experience before you head out.